SALTGRASS STEAK HOUSE TO OPEN AT BRANSON LANDING! Get your glad rags on! We’re going to the 1950’s! 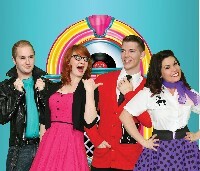 Clay Cooper Theatre is excited to take you down memory lane with our NEW show, Hot Rods & High Heels, to revel one of the greatest music eras of all time. Dino – “America’s greatest piano showman”, is back in Branson, with his brand new show at the Kings Castle Theatre, right on the main strip. The award winning pianist is delighted to announce that his latest show, “The Entertainer” is coming to Branson. The show features Dino and his wife Cheryl, who will take you on an international musical journey, telling the audience about their humble beginnings, their trips around the world, and the adventures that Dino’s talent as a master pianist have opened up to them. “The Entertainer” brings the Glitz and Glamour of a Las Vegas show that is wrapped up in old Branson charm. Dino brings the sparkles, the diamonds, and the extravaganza, but you also get a genuine, wonderful, joyous occasion when Dino’s music brings tears to your eyes, and love in your heart. 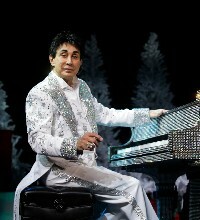 Dino is the undisputed number one piano showman in America today. His shows sell out all over the United States, and indeed, the world. He has taken his music around the globe, and back again. His concerts in Branson have been legendary, and the whole of Branson is excited that he is back, to appear live on stage in his new show that will thrill audiences, young and old. Dino’s wife Cheryl will perform joyous songs, in the style and charm that has won her legions of fans nationwide. Dino’s famous grand piano has almost 30,000 Austrian Crystals, assembled by hand, to make it the most unique in the world. See the famous piano, watch a master showman at work, and enjoy the most wonderful piano music you will ever hear. During the show, Dino tells the story of his life. You will hear how he started out as a little boy, learning to play an old piano that was donated to his family, and working his way up to eventually play for Presidents and Royalty. Dino’s wonderful stories will fascinate you, as he talks about his career, and his concerts around the world. His piano skills are amazing, and his charm and natural talent shine through to the delight of his loyal audiences in a show that brings the world of classical music and popular standards, to life. This Missouri native has sold nearly six million records and her last four albums have been certified Gold, Platinum or multi-Platinum. She’s scored five No. 1 hits, among them “Suds in the Bucket,” “A Real Fine Place to Start,” “No Place That Far” and “A Little Bit Stronger,” the title track of her chart-topping 2011 album Stronger. Since emerging in the late 1990’s, Evans has enjoyed a prolific recording career with nearly 6 million records sold and 5 chart topping # one Country singles including the self-penned “ Born To Fly.” She has also been honored with numerous accolades, including ACM Female Vocalist of the Year & CMA Music Video of the Year. “We are honored to host Sara’s first performance in Branson and excited to bring this talented vocalist to the area .” Larry Wilhite, General Manager. “This is a great opportunity to enroll in the food handler course offered at no cost,” said Craig Rhoads, TCHD environmental health division manager. Anyone who works, or plans to work, in a restaurant or other type of food establishment in Taney County is required to successfully complete a food handler’s training course. The course covers safe food handling, cleaning and sanitation guidelines, and basic food safety procedures. This course is regularly offered on a monthly basis, for a nominal fee. It’s also available online in both English and Spanish versions. Registration for classes is required. Please call the Taney County Health Department at (417) 334-4544 ext. 247 to register today. Seating is limited at all locations. Visit www.taneycohealth.org for more information. jackson+appleton takes Best in Show- Two Years in a Row! Best in Show – Two Years in a Row! For the second year in a row, jackson+appleton took home the evening’s top award, Best in Show, for Film & Video at the American Advertising Awards. Hosted by AAF of Joplin, The Addy Awards bring Advertising Agencies, Production Companies and Television Stations from Missouri, Kansas and Arkansas together to honor the area’s best advertising. jackson+appleton’s branded documentary, “for Love of the Line,” produced for White River Valley Electric Cooperative, won the prestigious Best in Show Award. White River’s documentary also earned jackson+appleton an additional two GOLD Addys for Cinematography and Editing. This is the third Best in Show for jackson+appleton since the company formed just 7 years ago. Additionally, jackson+appleton brought home Silver Addys for Videos produced for Paul Mueller Company and the non-profit organization, Gift of Hope, and also for a Commercial for White River Valley Electric Cooperative. The most awarded production company in Southwest Missouri, jackson+appleton has been honored with a total of 66 Addy Awards, including 29 Gold Addys. Annually, the American Advertising Federation conducts the world’s largest advertising competition through its 200 member advertising clubs. Sponsored by the American Advertising Federation of Joplin, the American Advertising Awards honor excellence in advertising and cultivates the highest creative standard in the industry. Owned by Robin Jackson and Nicholas Jay Appleton, jackson+appleton is a full service production company serving Missouri and beyond. 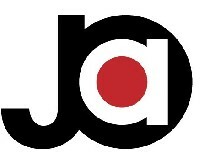 Winning videos projects may be viewed at jacksonappleton.com.